Sisters Elena Morcelli, Debbie Li and Loredana Mazzei pray on a November evening at the St. Lawrence Catholic Center. 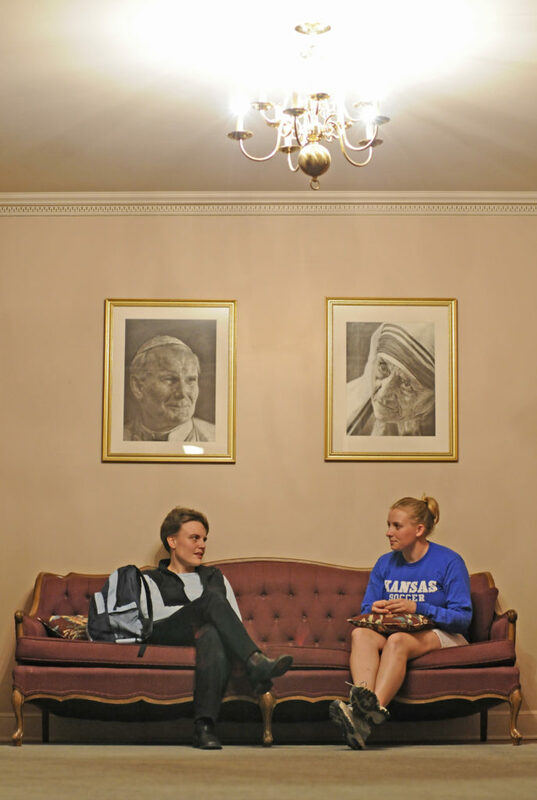 From left, Sister Elena Morcelli talks with Kansas University senior Rachel Schieber, of Kansas City, Mo., at the St. Lawrence Catholic Center. Apostles — those stern, bearded guys following Jesus of Nazareth? That’s so first century. 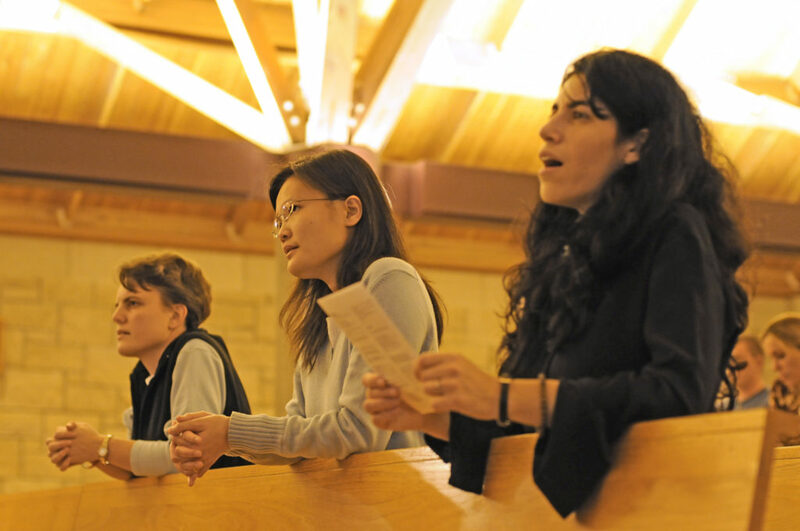 Lawrence boasts four female, modern-day apostles. They post on Facebook, share a Verizon cell phone and minister to clergy and laity, particularly Kansas University students. They’re the Apostles of the Interior Life, a Catholic order with sisters in two U.S. locations: the University of Texas A&M and KU. “Interior life is the life of our spirit, of our soul, and so our community wants to pay attention to this part that is more hidden,” says sister Elena Morcelli, an apostle. This life involves thoughts, desires and emotions. “We try to recognize how those are from God and lead us to God,” Morcelli says. Recognized by the Diocese of Rome in 1996, the order has a Web site at www.apostlesofil.org. Eleven apostles are in Rome, of whom four are studying at the order’s house of formation. Apart from the four at the St. Lawrence Catholic Campus Center, 1631 Crescent Road, four are at Texas A&M University. Morcelli is quick to note that the apostles’ casual, everyday attire isn’t a statement against traditional Roman Catholic sisters’ habits. The job requirements, so to speak, of apostleship involve four elements. The first is a strong prayer life — a minimum of four hours a day. This includes the rosary, Mass and other liturgical services, Morcelli says. The second element is the apostolate, or their activities on campus or in the center. The third is ongoing formation, or time in theological study. Monsignor Vince Krische, who was the center’s chaplain for 28 years, helped bring the apostles to Lawrence. He invited them to visit KU in 2003. Krische, now pastor of St. Ann’s Catholic Church in Prairie Village, says the sisters provide spiritual direction on a one-to-one basis, which the center’s classrooms of 10 to 80 students couldn’t give. “They were a perfect addition,” he says. Morcelli estimates that each year, the sisters see about 100 students regularly — about 30 to 40 students per sister. No exact figures are available on the number of Catholic students at KU. The Rev. Steve Beseau, the center’s chaplain, puts the estimate at 4,000. Each week, 1,000 students attend Mass at the center. Beseau says the apostles are witnesses to joy, community life and prayer. “Apostle,” he says, means one who is sent — and these have been sent to teach the interior life. The apostles have room and board from the center, and they live on donations such as money, clothes or furniture. They send any surplus donations to Rome to support those studying to become apostles, Morcelli says. “People at times kind of wonder, but we want to show them that we are normal people, but yet with a different call,” she says. For Morcelli, that call involved coming to Lawrence from Italy, with no knowledge of the culture and little understanding of English. “It’s not like Italian versus American type of thing, but this concept of holy leisure and joy — breaking the craziness of this machine,” she says. Becca Ashley, Olathe senior majoring in Spanish education, has spent all four years of her time at KU under Morcelli’s spiritual direction. Ashley says the apostles taught her how to live in joy as Mother Teresa described it, to put Jesus first, Others second, and Yourself last — J-O-Y. “I understand who I am and who I’m supposed to be because I understand more that I was created to live in this joy; I was created for a specific purpose,” she says. Because her father worked for Singapore Airlines, Sister Debbie Li says, she grew up all over the world. “Since I was 2 months old, I’ve been traveling,” she says — California, London and Honolulu, to name a few. Her academic dream had been to go to Oxford to study engineering, and she was accepted there. “I was ecstatic,” she says. Before she went, however, a multinational company in Singapore gave her a full scholarship to the University of Illinois at Urbana-Champaign. She decided she couldn’t refuse. The university, which Li describes as a kind of “Catholic Disneyland,” at that time had a house for several of the Apostles of the Interior Life. During Li’s sophomore year, she met Sister Tiziana Mazzei and started a journey of spiritual direction with her. “I was pretty close to getting married,” she says, of the time before she chose consecration. The person she had been dating was Protestant, and she says they had a really good relationship. “He taught me the meaning of what it means to love,” she says. At the same time, she says, she believed later that God was calling her to give her life to more than just one person: to God in an exclusive way. She says her former boyfriend was extremely understanding of her decision. Li attended the order’s house of formation in Rome, where she spent two years studying philosophy and three years studying theology at St. John Lateran, an international pontifical university. During her fourth year in Rome, Li took her vows of consecration on Dec. 8, 2006. Questions raised about her faith don’t shake Li. She says she likes the challenge of giving reasons for her faith, which in the end, she says, is about a relationship with God. “God is not a concept; he’s not an abstract idea. … You couldn’t marry a cause. You marry a person; you give your life for a person,” she says. She acknowledges that some might find it difficult to enter into such a relationship. Sister Loredana Mazzei comes from a family of consecrated siblings. Three of the four daughters, including her, are consecrated. She says her parents had a wonderful marriage, and because of that, Mazzei always dreamed of having a family. “I had a great experience of what it means to love one another and love in a family environment,” she says. One of the things that marked Mazzei’s spiritual journey was the death of her father when she was 14 — seeing his faith and peace even in the midst of pain. He would go to Mass and read the Bible every day, she says. “When he passed away, I wanted so badly his joy because I knew that when you are in a difficult situation, paradoxically, you can be even joyful,” she says. “When my sister Tiziana decided to join Susan, I still thought that she was a little bit crazy,” Mazzei admits. Then Mazzei went on a spiritual retreat, where her roommate was studying to become a nun. Mazzei says her roommate’s joy led her to reconsider her perspective on consecration. Then life continued, and Mazzei started dating. She says they had a great friendship in the Lord. Mazzei says she has generally found people to be more religious in the U.S. than in Italy, though at times, she says, they lack clarity on spiritual beliefs. “When you sell a product, that product can be liked or disliked. … We are not selling a product, but are talking about someone that is already at work in each soul, whether they admit it or not,” she says.